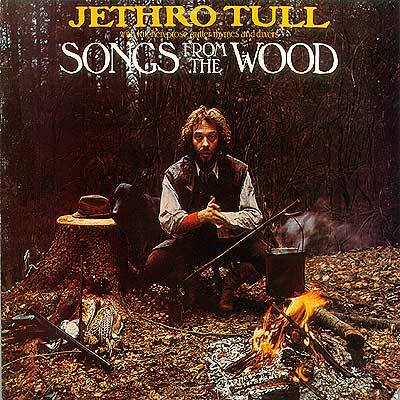 While Folk music has always been quite an obvious influence in Jethro Tull’s music, the band has never explored the genre as much as on 1977’s appropriately titled ‘Songs From The Wood’. Two years prior, the brilliant ‘Minstrel In The Gallery’ already hinted at this with its more acoustic based material, but it wasn’t until main man Ian Anderson moved to the countryside and immersed himself in English folklore, that Jethro Tull made its most Folky record yet. And not without Anderson’s unique sense of irony; the album cover clearly states that we will be treated with “kitchen prose and gutter rhymes”. One of the reasons why ‘Songs From The Wood’ is one of the best Folk Rock albums ever released, is that it doesn’t ignore the Rock part of that. For instance, ‘Hunting Girl’ is one of the heavier songs Jethro Tull had done up until this point, with its pulsating riffs on both guitar and bass and impressive double bass drumming by Barriemore Barlow. The lyrical subject matter is definitely inspired by folklore and there are some Folk melodies, mainly in the keyboards of John Evan and David Palmer, but this is still very much a Hard Rock song. After the a capella intro, the title track opens in a rocking matter as well and ‘Pibroch (Cap In Hand)’ has Anderson’s flute and Martin Barre’s distorted guitars battling for attention. As for the Folk stuff on this record, although Tull has had its fair share of brilliant Folk-inspired songs in the past (‘Skating Away On The Thin Ice Of A New Day’ and ‘Wond’ring Aloud’ spring to mind), the melodies have never been quite as captivating as the main melody on ‘Cup Of Wonder’ or the fantastic ‘Jack-in-the-Green’, which features Ian Anderson on every instrument. It’s almost as if they were learning Folk before ‘Songs From The Wood’ and the album is the first product of a Jethro Tull fully understanding the genre. I’m generally not too fond of bands mixing European Folk with contemporary genres – I possess a distinct hatred for European Folk Metal, for instance – but this is just one of those albums where all the pieces fall together in just the right places. Combined with a fantastic production, ‘Songs From The Wood’ is one of those must-hear albums from the seventies. Jehtro Tull’s had quite a few actually and since they’ve been on heavy rotation at my place this week, I could have picked any of their albums from the 1971-1978 era, but this album has just been a landmark album for Jethro Tull finally reaching what they have been hinting at for all these years. This is where the Hard Rock and the Folk really came together with Ian Anderson’s unique sense of humor. Want a proof of the latter? Check out the gramophone needle on the dendrochonological growth rings on the album’s back cover and try not to chuckle.